BJ Burlace and Garrett Nilsen helped St. Mary’s lacrosse return to the win column Friday. Nilsen scored two goals and Burlace added an assist as the No. 2 Saints defeated third-ranked Gilman in a MIAA A Conference match in Annapolis. 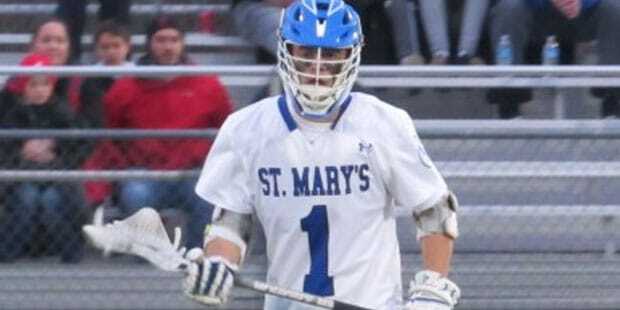 After dropping its first match in MIAA A Conference lacrosse earlier in the week, St. Mary’s High rebounded on the confines of Pascal Field Friday evening. The second-ranked Saints defeated No. 3 Gilman School, 8-6, in Annapolis. Garrett Nilsen and Nick Lilly each scored twice for the Saints (7-4 overall). Johns Hopkins bound-attack Ian Krampf added a goal and an assist, while Allen Hockenberry had a goal. 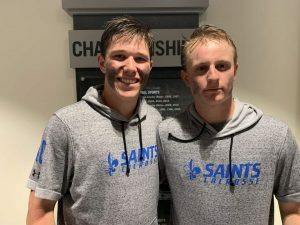 The Saints jumped out to an early 3-0 advantage, then held the Greyhounds (7-3) in check offensively in the second half to knock their Baltimore rivals out of first in the nation’s toughest high school boys lacrosse league. Top-ranked and two-time reigning champ Calvert Hall College (4-0), which was off Friday, has sole possession of first. 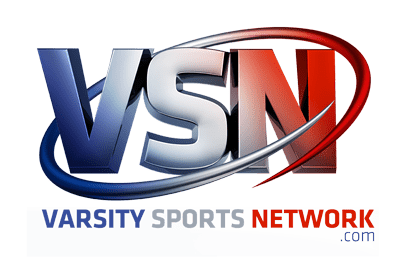 Four teams are tied for second in the loss column with St. Mary’s and St. Paul’s School (both 4-1) and Gilman and Boys’ Latin (both 3-1). St. Paul’s defeated John Carroll School, 16-11, Friday while BL capped a strong week with a 15-8 victory over Loyola Blakefield (3-2). The Saints ended the second full week of the MIAA A grind on positive note, never trailing Friday. Tuesday, St. Mary’s dropped its first league match, 13-9, at Calvert Hall. Schmidt, a junior goalie, made 10 stops in the cage as the Saints’ defense held Gilman without a goal until the final minute of regulation. The Saints led 3-0 midway through the opening period Friday on goals from Lilly, Zach Dudley and Ripley. The Greyhounds rallied, pulling even at 5 on Logan Paff’s goal in the second quarter. St. Mary’s regained the lead late in the half as Burlace, who will attend defending national champ Yale in the fall, found Lilly for the lead score. Nilsen ripped a shot past Greyhound goalie Noah Klein midway in the third, making it 7-5. With the shot clock winding down, Allen Hockenberry’s goal extended the Saints’ lead with 8:10 left in regulation. Will Godine finally got Gilman on the board with his second tally late in regulation. Sam King, Paff, Zack Witherspoon and Jack Tortolani had one goal each for the Greyhounds. Klein also had 10 saves. It was the first MIAA A loss for the Roland Park school which appears poised for a serious playoff challenge in longtime coach Brooks Matthews’ final campaign. Matthews said his squad didn’t play with composure in spots Friday. The Greyhounds are back on the road Tuesday at St. Paul’s in a battle of second-place teams. St. Mary’s and BL, the other second-place squads, meet Tuesday on Lake Avenue. “At the end of day, it’s about the 48 minutes on the field,” said Saints coach Victor Lilly.